A question for you all. As I wrap up Spacetrawler, and am developing the strip which will replace it, I am planning to stay in the Sci-Fi genre. I have received a lot of praise for doing sci-fi in both a funny and respectably-true-to-genre way. What I want to know from you all is: what I can do to do it even better? If there is anything you’d like to see me weave in more in the new project let me know. Also, if you know of any bloggers/podcasts/critics/etc who focus on sci-fi, I would like to write some of these folk to do regular sci-fi critique and ask them the same thing, so let me know who you look to for that kind of info. In addition to doing a guest strip for Chris Hallbeck’s Minimumble, which ran last Tuesday, I also did a fill-in for his comic Book of Biff. Check it out. When posting about YA books, two readers stepped up and sent me copies of their OWN books. Nice! I just finished one of them, “Emperor Dad” by Henry Melton, which was very cleanly written and a fun ride. Winner of the 2008 Darrell Award, check it out. Had a good weekend. On Saturday, my girlfriend and I saw a matinee of “Love Is All You Need” which was mostly good-hearted. 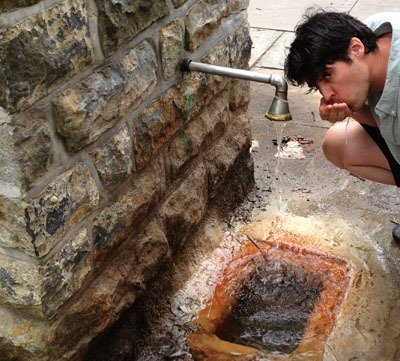 On Sunday we explored the Saratoga Springs State Park, including some swimming, some picnicking, some wandering about, and of course, some drinking from the “very very good for you but kinda unpleasant tasting” mineral springs. Well, there goes the Draak-Sim as a time scale reference. And Dimitri’s hair and beard have returned to their original shade? If they called *themselves* the Pan-Universal Geniuses, that automatically puts a fairly low ceiling on my ability to take them seriously. You forgot about his hair color. A Pan-Universal Gargleblaster must put the Pan-Galactic Gargleblaster to shame. Dimitri’s probably tested that theory. Also, I really prefer Dimitri as a silver fox. Christopher, I’d suggest sending a message to Howard Tayler over at “Schlock Mercenary”. He’s been doing great sci-fi for quite some time. @War Pig: Schlock Mercenary is linked in the SciFi Comic Links roll on this page. I know there are stellar-archeologists and galactic historians would have stabbed poor Dimitri in the eyes repeatedly, brutally and painfully for throwing away that operator’s manual! But him throwing it away as boriing is purest D. Sokolov! Oh Dimitri, I would expect nothing more and nothing less of you. @WarPig: Shlock Mercenary has been having pacing issues and sub-his-own-par writing for quite some time lately. I don’t know what happened but I know it isn’t the sci-fi landmark it used to be. Don’t let the next one end!! OK. I get that isn’t really on the list. But as each strip gets posted and we get closer to the end, I get a tug on my heart because I won’t be visiting with the characters anymore. I don’t really have any suggestions for making the next one better I guess. This is mostly just fan squee in a passive distracted squee sort of way. @JOhnCourage (and others), Ha! Yes, I had actually drop-colored his hair gray, but had forgotten and left the washes brown (which dominated the visual scheme). But it’s fixed. The silver fox is back. @Jerkwallace, tempting. I might go that way. But I think I might rather give myself a little more work than try to squeeze in an extra line of dialogue to “explain” it. We’ll see. @WarPig, good idea actually. I will. @Fabian, I think Howard Taylor’s problem is simply that he’s jumped the shark. He has too much invested in the characters and their organization to do anything really revolutionary with Schlock Mercenaries. The solution is to do what Chris says he’s already planning: end the series and write something else. @sara, thank you! But it will. I’ve already figured out the ending. I mean, like Spacetrawler and all my projects, I leave them open to potential sequels, but I like beginning-and-ending stories. Keeps me really super-exicted about the projects, which I think translates to my writing. IMHO that was kind of a jerk move on Dimitri’s part. Oh well. Hopefully it won’t get all that far before somebody finds it. If nothing else, somebody’s bound to come by to find out why the Draak-Sim stopped rotating. I’ve always found that the story comes first. You’ve got that right here… the science doesn’t overwhelm the fiction. When it goes the other way around I get twitchy though, in other words there has to be something “reasonable” about the science or my suspension of disbelief evaporates. You’ve got the perfect balance here. What would I want to see? Look to the last line of your blog today. Could you incorporate something “very very good for you but kinda unpleasant tasting”? @Grizzly, first off, thank you. Secondly, can you clarify? 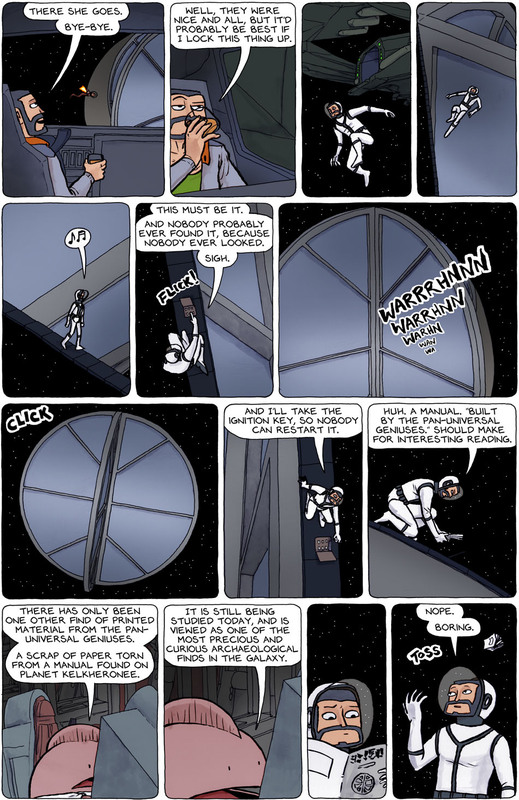 In Spacetrawler, I’d say what happened to Yuri, the eebs in spacetrawlers, Martina, and the ites/furryites kinda fit the bill of what you’re describing. But since you’re asking me to in-the-future incorporate this type of thing, I must assume that you mean something else. @KQY, ooooh, that’s a solid BS explanation I like. I might use that, thank you! Noooo! How will everyone tell time now? And it will take [unknown unmeasurable quantities of] time before word gets out, anyway. I used to read Sluggy Freelance (cut way back on my webcomics a few years ago as I got busier). The only SF podcast I listen to currently is Escape Pod. I also recommend checking with Mur Lafferty. My 9 year old daughter recently noted that one reason she likes Harry Potter so much is that some of the characters die. It makes it more real to her. 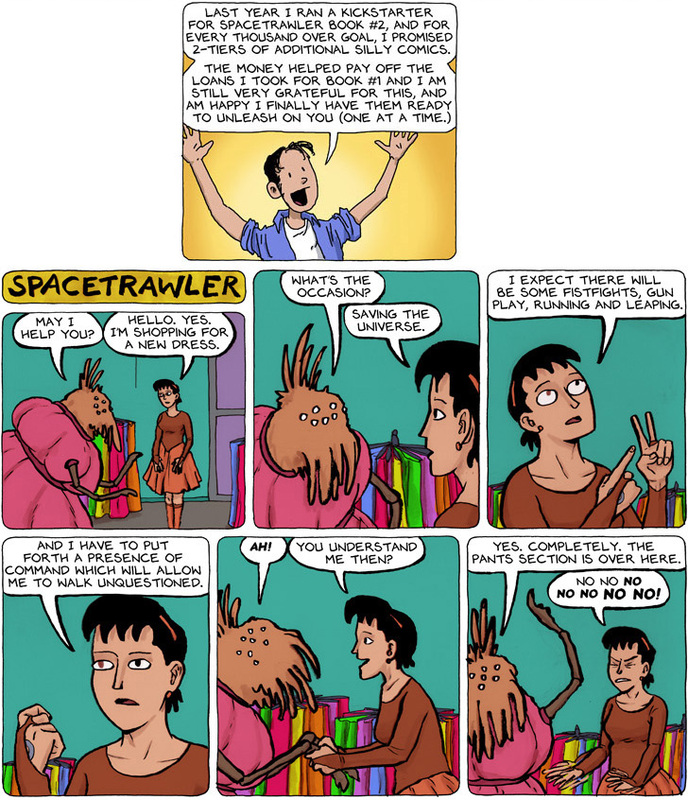 I think you already have that aspect incorporated in Spacetrawler, though. I guess it can be as vague and specific as you’d want it to be, sort of like one of those 10 minute writing topics. Could be a plot device, could be a theme, could be background for a character… I’ll leave it up to you! Mwahaha. You’ve got to wear the pants to leader. It says so in the manual. Now where is that manual? If they are all truly geniuses then they may be telling the sober truth and not just grand standing. Gibberish can be intelligible on a certain level. Or it really is gibberish. So now the Ites are trapped in our universe and can never go home? It’s my turn to be picky. In the bonus strip, you show Martina with her red eye, yet she is obviously (to me, anyway) describing events that will take place “in the future”, i.e., before she lost her eye. Like, after they’ve been on the mall planet but before they escape from the G.O.B. headquarters. You know, when Gurf stops Yuri from destroying the Apex-Speaker and she demands a do-over? And re: Howard Taylor and “Schlock Mercenary”, I think the problem now isn’t that he’s “jumped the shark”, it’s “How do I support my family doing this thing I love?”, and he may be getting bogged down in multiple projects. I’m sure that last bit is something Christopher has to worry about. I picture him relaxing evenings in his smoking jacket, a snifter of brandy in one hand and a quaint and curious volume of forgotten lore in the other. you ask “What I want to know from you all is: what I can do to do it even better?” You have developed some truly amazing characters that make me want to show up every week, and placed them in a universe that makes me laugh and smile and think and pay attention and cringe at the phrase “As I wrap up Spacetrawler.” The characters form bonds and clash in believable and entertaining ways. Wait, so a scrap of paper is one of the most precious and curious archeological finds in the galaxy, and is studied intensively because it came from the Pan Galactic Geniuses… but no one has given the Draak-Sim so much as the cursory inspection needed to find the control panel, key, and instruction manual??? Does the door really need to have four panels? Could the doorway itself be an odd folded shape that allows three panels? Something in SciFi that has (as far as I’ve encountered, and I’ve read *a lot* of SciFi in my 42 years) never been done properly is a planet with a very high population density. Authors simply fail to do the math. Take Earth (please!) for instance. Right now the entire human population could fit within the State of Texas and each person would have over 1,000 square feet of space. To really pack in the sapient beings, perhaps you want to allocate only 200 square feet per person, that’s some very large numbers. For Earth’s land area cover it all with a four level structure, top level for food production, middle two levels for living space, bottom level for resource extraction, waste management, building services etc. Take 50% of the space of the middle two floors for electric, plumbing, HVAC, hallways, light shafts, green spaces, shops and other non-residential uses. What’s the population number, giving 200 square feet per person on two levels (to equal the land area of Earth)? Over nine point seven quadrillion. Note that if you want “closest sized apartments” for all, you can use a lot more than 50% of the two levels for non-residential space. Covering a planet with a 100 level building or lots of separate mega-scraper buildings is flat out silly. There’s simply no way any planet could ever need the lebensraum for 20 or 30 quadrillion individual sapient inhabitants. The four level design, using all of two levels just for supporting the population, might work. More than that and resources will have to constantly be imported and ‘byproducts’ such as waste and manufactured goods constantly exported. Stop the flow and in a couple of days the inhabitants simultaneously starve to death and get buried in their own crap and tourist tchotchkes. One rather large issue with such super population levels is body heat. Humans are good sources of heat (though not enough to run a world Matrix style). So good that the Mall of America has no heating system, only air conditioning. Even in the dead of winter there’s enough people in it to keep it warmed up. Someone want to calculate the mall’s typical population density? A question for the super Star Wars fans, is all of Coruscant covered with those huge buildings or is that just one city? If it’s supposed to be the whole planet… *snerk* *snort* *giggle* Everyone could have a 10,000 square foot (or larger) apartment. Next up, the impossibly dense asteroid belt. Long a favorite of visual SciFi and often written about. An asteroid belt dense enough to where spacecraft can slalom in and amongst the rocks playing hide and seek is dense enough to conglomerate into one big rock under the force of its own gravity. There is one situation where it is possible to have a large field of debris with the occasional lump – inside the Roche Limit of a body with a strong gravity gradient. Saturn’s rings are mostly within its Roche Limit, thus they’ll never ever glomp together into one or more large moons. The small moons that do exist within the rings happen to have a tensile strength high enough for their size to keep from being ripped apart. The rest of the rings are either debris that was always that small or larger hunks that have been ground down over millions of years of micro collisions. Even so, the rings aren’t too dense. Voyager 2 passed through them and survived. The mission controllers were prepared for that to be the end of the probe but to their surprise and relief the instruments for detecting impacts only recorded a few, though it’s likely that more happened than were reported due to the design of the sensor. It was made of an array of gas filled cells and could only report a state change to one cell at a time. All the gas had to escape from a punctured cell before the sensor could read another impact. Everything that was functional on Voyager 2 before passing through the rings still worked on the other side, thus nothing hit it that was large enough to disable anything. But what about a movie style hide and go seek asteroid belt? Explain that it’s a relatively recent result of a large asteroid getting captured by a very large planet or failed dwarf star, dragged down within the Roche Limit and broken up by tidal forces. It’s only been there a few hundred thousand years so the kibbles and bits haven’t become crunched into gravel yet. The only asteroid belt we have direct experience with is very sparse. Anywhere in it where you could naked eye observe one asteroid while standing on or floating next to another is a very rare location. IIRC, such cases have small asteroids orbiting larger ones like a large scale model of the Earth-Moon pair. Give a Ceres or Vesta sized rock a few Phobos and Deimos sized companions and you can still have a bit of a space dodge-em scene away from a big gravity source. Sooo, those are the two things I’d like to see in a SciFi story. A high population world with enough inhabitants to actually justify elbow to elbow Tokyo commuter train density everywhere – without implausible overabundance of living structure – and a dense asteroid field with an actually plausible explanation for its existence. Or even a high population dense asteroid field. Pottybot needs his own series! Although i imagine it would be more horror than comedy. @Galane, Thanks! I always love logically-constructed environments. How about this for a population-limiting event: a colony built in the remains of a huge asteroid crater, simply because the air pressure on the surface is a tad too low — the bottom of the crater has enough oxygen and nitrogen that you’re able to breath without needing a mask. I don’t have any “you should try this” ideas for the next book. I just have a warning. If you start thinking about a crazy thing with multiple timelines going in parallel on the next page… DON’T. It’s maddening. @Galane – Well, technocrats tend to forget the enormous amount of land needed for air an water reclamation, i.e. forests. If a planet was covered in constructions of a sentient race, they would have to use massive amounts of their building space for such uses. Not counting food production ect. I do not believe that three times the dwelling space would even remotely be enough. Youll do great, no matter what. Ill be following your work with much admiration. Does anyone else feel like stopping the Draak-sim’s rotation is on par with destroying that iridium weight at the International Organisation of Standards that’s EXACTLY 1 kilogram in mass, and used to calibrate all other kilogram weights and derived units in the world? Like a knife to the heart. Galane – excellent thought and concisely put. However, you forget that there is no need to have a sci-fi universe that is ‘millions of years’ old. A lot of writers choose that format, since it is fiction after all, but it is almost never necessary to the story. Oh yeah, and Chris – stay away from time travel. There is no way to do time travel without it being paradoxical in one way or another. You can have the best sci-fi story in the world, and then you throw in some part about time travel and it ruins the whole story. For example, Star Trek delved into time travel, and those episodes were terrible (entertaining, but nonsensical). You can do good time travel stories. But you have to set down rules for how it works, and it has to be consistent. It needs to be clear, at least to the author, how that universe deals with causality violations. In truth, if you go for really hard sci fi, it’s a problem you’ll hit already the moment you introduce FTL travel to the universe. If FTL is possible, it’s going to allow you to violate causality, and what do you do then? It then goes about its own business, and does not really bother anyone, except to swiftly destroy any civilization that dares violate that rule. Thus, you get FTL, but causality preservation gets treated like a law of nature that you can’t usually break without dire consequences. Allowing causality violation as a natural consequence of FTL is not a bad idea, but I think there still needs to be a steeper barrier to its use. Possibly implemented by intelligent beings who realise how bad of an idea it usually is to break causality. Seriously, it’s the DRAAK-SIM, a door between universes, an actual piece of wondrous technology from the pan-universal geniuses!! Why are there not researchers crawling all over it? @WellWellWell That’s why the top level is all for food production. If 100% of Earth’s land area was made suitable for high yield agriculture it could support a lot more people. ‘Course to do that on the same planet as the population to be fed, the inhabitants would have to live under the farm. Here’s a thought experiment. You have a spaceship capable of moving at twice the speed of light and it sets out on a trip from Earth to the Alpha Proxima/Centauri system, four light years away. At each end of the route there’s a telescope capable of observing the spacedock the ship will leave from and arrive at. Let them observe for four years before the ship leaves. Thus the Alpha scope will be able to see the ship at Earth. The ship launches and arrives on schedule at Alpha in two years. The Alpha scope still sees the *image* of the ship parked at Earth for two more years while the Earth scope will not see the *image* of the ship arrive at Alpha until two years after it arrives. The ship offloads and picks up cargo and passengers at Alpha, heading back to Earth. The engineer manages to squeeze a bit more speed out of the drive so it cuts the trip down to less than two years. The ship arrives back at Earth before the Alpha scope is able to see the *image* of the ship leaving Earth – but it will not and cannot ever see TWO ships in the same space. What it will see is an empty spacedock for a bit less than four years. The ship does NOT make it back to Earth before it leaves. I suppose that at some very specific distance a telescope with the resolving power to see something as small as an interstellar spaceship would see the *images* of two of the same ship in the same place at the same time, but only briefly as the light reflected off the ship keeps on moving outward. What observers *outside* the spacecraft see is NOT time travel. Depending on the observers’ location it may *appear to be* that the ship has “doubled back” to before or the same time it left – but the ship never *physically* does so. FTL = time travel is a confusion of point of view. If you’re on a ship moving away from a giant clock at the speed of light, it is only an *appearance* that the *image* of the clock has stopped. If you could still see the *image* of the clock behind you as you exceed the speed of light, it would appear that the clock’s image has begun to move backwards. However the clock is still ticking along normally, just ask anyone observing it from right next to it. When that ship turns around after a year at light speed, the observer next to the giant clock is NOT going to experience the ship arriving before it left. The images of an FTL ship that an outside observer may see have no bearing on the physical object of the ship. What looks to you from your outside vantage point to be “time travel” is NOT “time travel” to the FTL ship. The observer has *no effect* on the observed when all that passes between the two is light images. The ship starts *here* then it is *there* with a finite amount of distance and time between *here* and *there*. The ship launches and arrives on schedule at Alpha in two years. The Alpha scope still sees the *image* of the ship parked at Earth for two *more* years while the Earth scope will not see the *image* of the ship arrive at Alpha until *four* years after it arrives. Well my blanket sci-fi suggestion is typically ‘more realistic aliens’. But your aliens have been pretty solid overall. Lots of different body types and all. Their faces are sorta overly human but hey, they’re cartoons, I’m not expecting gory detail. Galane thank you so much, that particular thing has bothered me for years, but I wasn’t quite sure that I wasn’t missing something in the math that I didn’t understand. FTL violating causality didn’t make any sense at all without some weird assumptions. Galane, Biliboy: Unfortunately, I’m not a physicist, so I can’t pretend that I am intricately familiar with the math of special relativity. The basic point, though, is that space and time doesn’t quite work as we tend to intuitively think of it. They are two sides of the same coin: The way you experience both space and time changes in such a way as to make sure that no matter how much you accelerate, light in a vacuum continues to move at the same speed relative to you. For example, travelling fast enough will cause both length contraction and time dilation. Wrapping your head around this is the key step to understanding special relativity. But framing it in terms of the speed of light is perhaps a bit deceptive. What is actually happening is that light in a vacuum moves at the speed of causality (because photons are massless), and the spacetime of all reference frames are adjusted so that the speed of causality is the same in all of them. Now, in the world of theoretical physics, events are assigned light cones. Every event has a light cone stretching into the past and future, representing everything that could have led to its causation in the past, and everything it may affect or cause in the future. For any event within the future light cone of some event P, every observer in every possible frame of reference will be able to agree that this event happened after P (and vice versa for events in its past light cone). That’s important, because those events may have been fully or partially caused by P. But any events outside of P’s light cones are unordered in relation to P, and different frames of reference can disagree wildly as to whether they happen before or after P.
FTL allows some event P to affect other events outside of its future light cone. And as soon as you have exited that light cone, all it takes is the use of another frame of reference to wrap that event into P’s past, and then do another FTL transition from that frame to enter P’s past light cone. It’s not just an observational thing: Special relativity means that events *really* have no definite order in relation to other events outside of their own future and past light cones. And so, under special relativity, FTL and time travel becomes equivalent: Time travel will allow you to travel into your past light cone, and thus exit your future light cone (FTL), and FTL will allow you to exit your future light cone, and thus jump into your past light cone (time travel). My explanation was inspired somewhat by this example. A world where people do things they hate because it’s healthy for you! !